My hat goes off to the marketing team over at The Four Seasons. They have done such an amazing job with their social media and online marketing efforts and their latest push was remarkable. I thought we could take a look at the launch of their “Around The World” experience which takes you to several destinations aboard the new Four Seasons jet. This is a remarkable product and also makes for a fun look at how having such amazing news can lead to a lot of marketing success. The great thing about marketing a luxury product is that you’re showcasing something that’s not only amazing, but it’s worth a lot of money. Put that information out to just a handful of the right people and the word will be spread like wildfire. This is a lot easier for big brands like The Four Seasons because they already have the infrastructure in place. For the smaller brands, this is why we cannot stress enough the importance of building relationships online and off, and in particular building the right kind of relationships. You could be a small company with an amazing product, and all it takes is a couple of bloggers or social influencers to make it go viral. In my example of the Four Seasons we’ll see how they managed to get big news out to the right people, and in front of millions of eyes within a week. This hotel company has a lot of competition in their space so a lot of their marketing noise tends to get drowned out a bit. This branded private jet experience just puts them over the top and it really caught my marketing eye. Bear in mind that I only have access to (not entirely accurate) public data to showcase how many social followers and search traffic The Four Seasons has. I imagine their newsletter and internal marketing lists contain tens of thousands of people to contact in a promotion like this, but we’ll be sticking just to the social media landscape. I just want to quickly showcase some of the numbers and reach they managed to hit with this campaign without me rambling on too much. Thanks to sites like Topsy and Google News I can get a good idea of how many influential and authority websites wrote about them. Because The Four Seasons has such a following, they more than likely didn’t pay for damn near any of the exposure. This is a result that feels REAL good when it happens, and I love the feedback from our own customers when we have this kind of campaign success. News hit hard and fast the other day thanks in part to the fact that Four Seasons has 227,823 Facebook Fans, 114,000 Twitter followers and 37,000 Instagram friends. Let’s also not forget that they have a vast network of Twitter and Facebook accounts for each individual hotel. Taking that into account along with their internal lists and newsletters, I can see why and how this news got such reach. 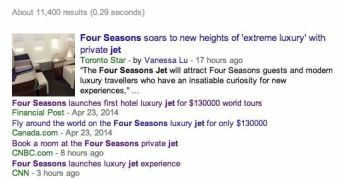 Since this news went viral, that also means the biggest and best sites in the travel industry are going to be linking to them. This is going to do wonders for their organic search in the long run and is just an added perk amongst many if you ask me. Now let’s break down different content marketing avenues here and see how well they did in just such a short time period. Keep in mind that I’m going on public data which will look different by the time you read this. With over 11,000 news articles and counting, I can tell their PR efforts paid off big time in this regard. Keep in mind that only 10-15% of the websites the news is on come from truly great news companies. The rest will just be second tier news aggregators, blogs and down right scraper spam sites. If you have news this big, make sure you push it out to the best wire services or don’t bothering wasting your money. They easily scored dozens of great news links and mentions from the likes of CNN, USA Today, Toronto Sun, Business Insider and tons more. These sites alone caused tens of thousands of social shares across many platforms, but mainly Facebook and Twitter. The news spread quickly across travel industry news sites like Tnooz, Hotel Chatter and Pursuitist. It took bloggers only hours to cover the news which again drove a lot more social shares across the usual streams. There will still be an onslaught of blog and news posts over the coming week from the slower journalists which will continue its push. This also makes me wonder how many print and tablet-based magazines will have an article covering the news. There’s a lot of potential for a second wave marketing attack in 6-12 month’s time, and they really have a lot of options to play with. It will be interesting to see how this works out for them business-wise, and we here at Team Luxury Branded wish them the best of luck.